Art treasures may have been stolen to order during the looting of Iraqi treasures in the aftermath of the recent war, a key archaeological adviser to the British military has claimed. Dr Peter Stone, is director of the International Centre for Cultural and Heritage Studies at Newcastle University. He said he told the Ministry of Defence that both opportunist looting and the stealing of treasures to order by foreign collectors were likely after liberation. It is feared the treasures, some 7,000 years old, will end up at the art markets of Paris, Switzerland, New York, London, and Tokyo. Dr Stone was speaking ahead of a conference on Tuesday at the British Museum, attended by Culture Secretary Tessa Jowell, which will look at the looting of Baghdad Museum. He advised the military for more than two months in his role as Chief Executive Officer of the World Archaeological Congress. Dr Stone said many of the world's greatest treasures could now be lost to mankind, and fears that priceless artefacts have been stolen for private collections. 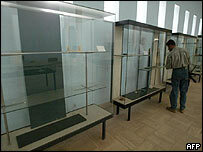 Baghdad Museum and other regional museums were plundered. Dr Stone said: "It would not surprise me at all if international art dealers had a hand in the plundering. "I would be very surprised if it were not the case that some of it had been stolen to order - although I have no cast iron evidence of that. "In initial reports we are getting there are indications that replicas of objects have been left in cases." His role included identifying key museums and archaeological sites in Iraq, so they could be included on the same list as hospitals and schools which were to be spared from bombing.